Imagined by Nadine Roth and Pascal Jaulent, cofounders of Face A Face, WOOW eyewear falls somewhere between traditional and casual styles – a trendy “London” feel that is chic and off-beat. Created with a sense of humor, WOOW frames literally speak to you with a little motivational message written in vintage style typewriter font on the temple tips such as “Get Out”, “Super Chic”, “Rock Me”, “So What” along with many other playful messages. Characterised by bright colors and a variety of shapes, the metal and acetate frames are inspired and fun. These glasses not only make you look great, they bring a positive energy to your life with a secret mantra behind your ear. 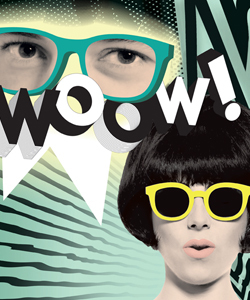 Handcrafted in Italy, WOOW frames are designed and manufactured with attention to quality and a flair for fun.